Let's call Mountain Hardwear's Optic 3.5 a car-camping tent with backpacking aspirations. The Optic isn't light, but it is abundantly livable. You get 45 square feet of floor space and a 48-inch interior height. Combined with the Optic's innovative marquee feature—a 180° view—all that space makes for a very comfortable interior, downright roomy for two adults, and easily big enough for three if you don't mind sharing. With the vestibules rolled up, that expansive view makes the tent feel even bigger than it is—a nifty trick. To further woo you, the Optic comes in two and three-man sizes, and is priced competitively for a premium tent. Is it backpacker-friendly? Certainly you can divide the Optic's six pound, five ounce weight with a partner (or two) to make for a reasonably acceptable overnight load. But I hesitate to recommend the Optic as a backpacking tent for an unexpected reason: I'm concerned about its comfort in rainy weather. That magnificent 180-degree view turns into a bit of a liability when rain starts falling, because the design doesn't allow us to set up a nice cross-flow for ventilation (as a traditional double-vestibule tent does). Surely the gold standard for comfort in rain is a tent in which we're not forced to keep everything zipped up tight. The curve of the Optic's body, however, extends well beyond the coverage of its puny awnings. You'll either need to creatively rig the vestibules in rain, or keep them (essentially) closed—not ideal. That's less of a concern for car campers because, let's face it, if it gets too rainy you can always jump in your car and go home. And, to be fair, ultralight backpacking tents make vestibule compromises as well. With car or without, keep the weather sunny and you won't care. 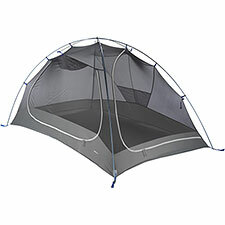 This is a massively comfortable tent, well-built, exceptionally livable, and quick and effortless to set up.